The term refers to the inspection of trees for roosting bats. This inspection is normally done when potential roosting features have been identified on the preliminary bat roost assessment from the ground. During the aerial inspection, the surveyor (who will have a bat licence) climbs the tree and use an endoscope (a device with a screen connected to a long tube with a camera at the end) to check the inside of the tree trunk for roosting bats. An ASSI is the Northern Ireland equivalent of an SSSI. This is an area designated by Northern Ireland Environment Agency in order to protect the best examples of Northern Ireland’s flora, fauna, or geological or physiographical features. BS5837 is the British standard which gives recommendations and guidance on the relationship between trees and design, demolition, and construction processes. It is a nationally recognised standard used by Local Planning Authorities (LPAs) to assess planning applications. The BCT works across many sectors to help those whose work brings them in contact with bats. They work to raise standards and advocate best practice, including the publication of Bat Surveys: Good Practice Guidelines, which is an essential reference guide for professional ecologists working with bats. The BTO is an independent charity aimed at studying wildlife populations, particularly birds, to inform the public and policy decision-makers. Their volunteer surveys, such as the Breeding Bird Survey (BBS), help to monitor changes in bird populations across the UK. The Oxford English dictionary defines compensation as “something that counterbalances or makes up for an undesirable or unwelcome state of affairs”. In terms of ecology, the word is normally used to mean a trade-off where the losses to wildlife are offset by the creation of wildlife opportunities of at least equal value. For example, creating a new pond should you need to destroy one for a development. A conservation area is a place protected against undesirable changes due to its notable environmental or historical interest. These are chiefly designated by Local Authorities. 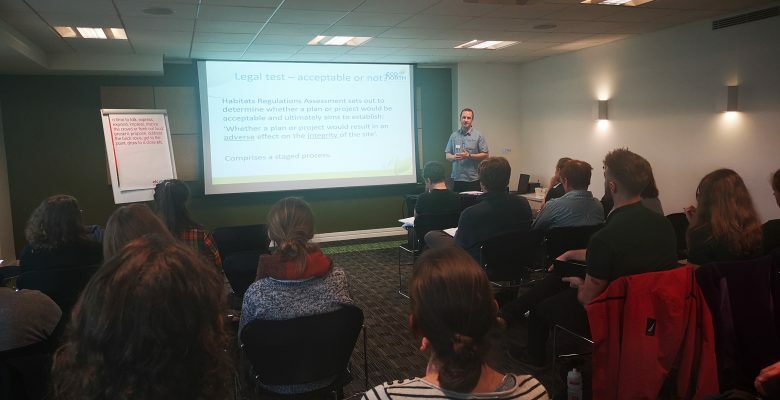 ECoW are consultants who work with companies on site, helping them to follow wildlife legislation and providing advice on compliance with the environmental planning conditions. This can include monitoring protected species and habitats, possible river and land pollution or auditing site activities, always with the goal of working collaboratively to find pragmatic solutions to any issues faced. Like an EIA, an EcIA is a tool used to identify the impact of a project prior to the decision-making, the difference being that an EcIA focuses on the impact on wildlife. The EcIA is often part of the EIA process. The aim of Environmental Impact Assessment is to protect the environment by ensuring that a local planning authority when deciding whether to grant planning permission for a project, which is likely to have significant effects on the environment, does so in the full knowledge of the likely significant effects, and takes this into account in the decision making process. The regulations set out a procedure for identifying those projects which should be subject to an Environmental Impact Assessment, and for assessing, consulting and coming to a decision on those projects which are likely to have significant environmental effects. The second aim is to ensure that the public are given early and effective opportunities to participate in the decision making procedures. The process of Environmental Impact Assessment in the context of town and country planning in England is governed by the Town and Country Planning (Environmental Impact Assessment) Regulations 2017 (the ‘2017 Regulations’). These regulations apply to development which is given planning permission under Part III of the Town and Country Planning Act 1990. These regulations apply the amended EU directive “on the assessment of the effects of certain public and private projects on the environment” (usually referred to as the ‘Environmental Impact Assessment Directive’) to the planning system in England. The EPSML is a type of licence obtained from Natural England in order to undertake actions which are otherwise illegal and will impact on European protected species. For example, if bats are known to roost on a building a company wishes to demolish, that company will require a EPSML. The application for a EPSML will require a method statement and a reason statement in order to ensure that no long-term harm is done to the conservation of the species. The extended phase 1 habitat survey, like the phase 1 habitat survey, classifies habitats using the JNCC standards. It is called ‘extended’ because the survey includes a search for protected species and signs. Natural England states that: “In accordance with the Habitats Regulations, all competent authorities, including Natural England, must undertake a formal assessment of the implications of any new plan or project which is capable of affecting the designated interest features of European Sites before deciding whether to undertake, permit or authorise such a plan or project”. The HSI is used to measure the suitability of ponds for great crested newts. Ten factors, including location, pond area and water quality, are measured, scored and used to calculate an overall score between 0 and 1. In general, ponds with higher HSI scores are more likely to support great crested newts than those with low scores. HSI assessments can be used to establish the need for further surveys or assess the suitability of receptor ponds in proposed mitigation schemes. The Hedgerow Regulations 1997 are intended to protect important countryside hedgerows from destruction or damage in England and Wales. The JNCC is a public body which advises the UK Government and other administrations on UK-wide and international nature conservation. Its work contributes to maintaining and enriching biological diversity, conserving geological features and sustaining natural systems. This is a legal document required in order to undertake actions which will otherwise be illegal. A licence relating to actions which affect wildlife is usually obtained from Natural England. Licences can be broadly divided in two groups. The first type is a Wildlife Licence which ecologists require to carry out their work. It gives permission to disturb and capture a particular protected species (such as bats, great crested newts, tawny owls) for the purpose of survey or research and is given on the basis on the ecologist’s experience and knowledge of the species as well as character references. The second type of licence is given for a particular project (such as building, demolishing or refurbishing a site) which will hurt a protected species. This is held by an ecologist who is required to present a method of mitigating the damage done to the species (for more information, see EPSML – European Protected Species Mitigation Licence). LBAPs set out priority species and habitats for conservation at a local level. They are produced by groups of collaborators who work together to conserve, enhance and promote biodiversity in the local area. According to JNCC: “The purpose of MNRs is to conserve marine flora and fauna and geological features of special interest, while providing opportunities for study of marine systems. They are a mechanism for the protection of nationally important marine (including subtidal) areas. Their designation requires the agreement of statutory and voluntary bodies and interest groups”. According to JNCC: “NNRs contain examples of some of the most important natural and semi-natural terrestrial and coastal ecosystems in Great Britain. They are managed to conserve their habitats or to provide special opportunities for scientific study of the habitats, communities and species represented within them. In addition, they may be managed to provide public recreation that is compatible with their natural heritage interests. The NERC places a duty on public bodies to consider and conserve biodiversity through the exercise of their functions and includes a range of measures to strengthen the protection of both habitats and wildlife. The Act makes provision in respect of biodiversity, pesticides harmful to wildlife, protection of birds and invasive non-native species. The phase 1 habitat survey is a standardised system which aims to relatively rapidly record the overall vegetation and classify wildlife habitats using the JNCC definitions. The data collected in this survey is used to map an area under consideration based on the habitats present. This is a useful tool as it records the area’s baseline and can help inform the need for further survey. The PEA is an initial assessment of a site which establishes the overall baseline conditions and evaluates the need for further surveys. RBAPs set out priority species and habitats for conservation at a regional level. They are produced by groups of collaborators who work together to conserve, enhance and promote biodiversity in the region. Schedule 1 lists all birds which are protected under the Wildlife and Countryside Act 1981 (as amended), by special penalties relating to disturbance at their nests or of their dependent young. The Habitat Regulations make it an offence to deliberately capture, kill, disturb, or trade those animals listed under Schedule 2. The Habitats Regulations make it an offence to pick, cut, uproot, collect, destroy or trade in those plants listed under Schedule 4. Schedule 5 lists animals (other than birds) which are specially protected under the Wildlife and Countryside Act 1981 (as amended). This makes it an offence to intentionally kill, injure or take any wild animal listed, and prohibits interference with places used for shelter or protection, or intentionally disturbing animals occupying such places. Schedule 8 lists plants (vascular plants, bryophytes, lichens and fungi) which are specially protected under the Wildlife and Countryside Act 1981 (as amended). Schedule 9 lists all non-native species of plants and animals which are prohibited from release in England and Wales, under The Wildlife and Countryside Act 1981 (as amended). According to the UK government, “Sites of Special Scientific Interest (SSSIs) are protected by law to conserve their wildlife or geology”. They are designated by statutory country nature conservation agencies (Natural England, Scottish Natural Heritage, Natural Resources Wales) in order to protect the best examples of the UK's flora, fauna, or geological or physiographical features. According to the JNCC: “SACs are designated under the EC Habitats Directive. The Directive applies to the UK and the overseas territory of Gibraltar. SACs are areas which have been identified as best representing the range and variety within the European Union of habitats and (non-bird) species listed on Annexes I and II to the Directive. SACs in terrestrial areas and territorial marine waters out to 12 nautical miles are designated under the Conservation (Natural Habitats, &c.) Regulations 1994 (as amended). Beyond 12 nautical miles they are designated under the Offshore Marine Conservation (Natural Habitats &c.) Regulations 2007 (as amended). SACs are one of six designations contributing to our ecologically coherent network of marine protected areas. Sites which have been submitted to the European Commission by Government, but not yet formally adopted by the Commission, are referred to as candidate Special Areas of Conservation (cSACs). Sites which have been adopted by the EC, but not yet formally designated by governments of Member States are known as Sites of Community Importance (SCIs). In the UK, designation of SACs is devolved to the relevant administration within each country. In UK offshore waters JNCC is responsible for identification and recommendation to Government of SACs. According to the JNCC: “SPAs are classified by the UK Government under the EC Birds Directive. The Directive applies to the UK and the overseas territory of Gibraltar. SPAs are areas of the most important habitat for rare (listed on Annex I to the Directive) and migratory birds within the European Union. SPAs in terrestrial areas and territorial marine waters out to 12 nautical miles are classified under the Wildlife and Countryside Act 1981 and beyond 12 nautical miles are designated under the Offshore Marine Conservation (Natural Habitats &c.) Regulations 2007 (as amended). The ARC is a wildlife charity which promotes the conservation of herpetofauna (reptiles and amphibians) in the UK. ARC develops and promotes guidance on managing habitats for amphibians and reptiles, such as the Great Crested Newt Conservation Handbook. The AA is a professional membership body for all those working in the arboricultural sector, providing professional standards, training, support and recognition for its members. The AA prides itself in being the leading voice in all arboricultural matter in the UK. They aim to support the sustainable management of trees for, the benefit of Society, through our members and close collaboration with allied professions. They work towards this aim by: inspiring society to understand the value of amenity trees; influencing decision makers to value, secure, fund and promote amenity trees and; improving the understanding of trees and their environment. The Habitat Regulations 2010 transpose Council Directive 79/409/EEC on the Protection of Wild Birds (the EC Birds Directive 1979) and Council Directive 92/43/EEC on the Conservation of Natural Habitats and of Wild Flora and Fauna (the EC Habitats Directive 1992) into UK law. The Birds Directive was amended in 2009, becoming Directive 2009/147/EC. The Habitat Regulations 2010 make it an offence (with certain exceptions) to deliberately capture, disturb, kill or trade in those animal species listed in Schedule 2, or to pick, cut, uproot, collect, destroy or trade in those plant species listed in Schedule 4. The EC Birds Directive requires member states to establish and monitor Special Protection Areas (SPAs) for all rare or vulnerable species included in Annex I, as well as for all regularly occurring migratory species, with key focus on wetlands of international importance. Annex I and II of the Habitats Directive respectively list those habitats and species for which a similar network of sites – Special Areas of Conservation (SACs) – must be established and monitored. Collectively, SPAs and SACs form a network of pan-European protected areas which are referred to as ‘Natura 2000’ sites. The Bern Convention was adopted in 1979 and ratified by the UK Government in 1982. The principal aims of the Convention are to ensure the conservation and protection of all wild plant and animal species and their natural habitats (listed in Appendices I and II), to increase cooperation between contracting parties, and to afford special protection to the most vulnerable or threatened species (including migratory species). Members of the European Community meet their obligations via the Birds Directive and the Habitats Directive. These are transposed into UK law by the Wildlife and Countryside Act 1981 (as amended), Nature Conservation (Scotland) Act 2004 (as amended), Wildlife (Northern Ireland) Order 1985, and the Nature Conservation and Amenity Lands (Northern Ireland) Order 1985. The CRoW, which applies to England and Wales only, strengthens the provisions of the Wildlife and Countryside Act 1981 (as amended), both in respect to protected species and statutory ecological sites, the latter primarily relating to the management and protection of SSSIs. It also provides for better management of Areas of Outstanding Natural Beauty (AONBs). The Act places a statutory obligation on public bodies to further the conservation of biodiversity through the exercise of their functions, thereby providing a statutory basis to the Biodiversity Action Plan (BAP) process. Section 74 of the Act lists those habitats and species of principal importance in England. The Nature Conservation (Scotland) Act 2004 places a duty on public bodies to conserve biodiversity, increases protection for SSSIs (including providing for Land Management Orders on SSSIs and associated land), strengthens wildlife enforcement legislation and amends legislation on Nature Conservation Orders. The Act requires Scottish Ministers to designate one or more strategies for the conservation of biodiversity (the Scottish Biodiversity Strategy) and to publish lists of species and habitats of principal importance. The Protection of Badgers Act 1992 consolidates the existing legislation relating to the protection of badgers and makes it an office in England and Wales to wilfully kill, injure or take a badger (or attempt to do so) and affords protection to both the animals themselves and their setts. This Act provides protection for wild mammals from acts of cruelty, primarily via preventing hunting wild mammals with dogs. The UKBAP is the government’s response to the Convention on Biological Diversity. Published in 1994, it identifies the nation’s most endangered habitats and species and sets out means of aiding their recovery so as to contribute to the UK’s progress towards a significant reduction in biodiversity loss called for by the Convention on Biological Diversity. The Wild Mammals (Protection) Act 1996 provides protection for wild mammals from acts of cruelty. An offence is committed if any person mutilates, kicks, beats, nails, or otherwise impales, stabs, burns, stones, crushes, drowns, drags or asphyxiates any wild mammal with intent to inflict unnecessary suffering. A Tree Preservation Order (TPO) is an order made by a Local Planning Authority to protect trees and woodlands, in the interests of amenity (i.e. if their removal will have a significant negative impact on the local environment and its enjoyment by the public). TPOs prohibit the cutting down, topping, lopping, uprooting and wilful damage or destruction of trees, without the LPA’s written consent. The UKBAP Species prioritise species that have been identified as being the most threatened and requiring conservation action under the UKBAP. The Wildlife and Countryside Act consolidates and amends existing national legislation to implement the requirements of the Bern Convention and the Birds Directive throughout Great Britain. The Act is the primary UK mechanism for the designation of statutory ecological sites - Sites of Special Scientific Interest (SSSIs) - and the protection of individual species listed under Schedules 1, 2, 5, 6 and 8 of the Act, each of which is subject to varying levels of protection. Schedule 9 of the Act also lists those plant species which it is an offence to plant or otherwise cause to grow in the wild, while Schedule 14 prevents the release into the wild or sale of certain plant and animal species which may cause ecological, environmental or socio-economic harm. Have you been asked for an ecological survey for your project?